Geology is the study of the Earth’s composition, structure, processes, and history. It is one of the major Earth sciences, which examine questions relating to the planet Earth. This node will look briefly at some of the major branches of geology: mineralogy, petrology, palaeontology, plate tectonics, geophysics, geochemistry, and planetary and marine geology. The Earth is made of three main layers: the crust, mantle, and core. The outer solid crust surrounds the mantle, and is between 3 and 6.8 miles thick under the oceans, and 12 to 40 miles thick under the continents. The mantle makes up the majority of the Earth’s volume and mass, and consists of molten rock 1,802 miles thick. The Earth’s core is 2,200 miles thick, and is composed mainly of iron, partly liquid and partly solid. Mineralogy attempts to describe the crystal structure, chemistry, and physical properties of minerals, including their creation and destruction. Geologists look at certain features of minerals known as cleavage, colour, crystal shape, fracture, hardness, specific gravity, streak, and striations. Petrology studies rocks, which are aggregates of minerals, and the conditions they form in. Petrology focuses its attention on the three types of rocks: igneous, metamorphic and sedimentary rocks. Paleontology is the study of ancient life on earth, based on fossils. Physical anthropology also examines human fossils and their evolution. The theory of plate tectonics states that the lithosphere is divided into plates which interact with each other and float around the planed on the asthenosphere. This helps explain continental drift and the Ring of Fire, which is marked by frequent earthquakes and volcanoes. Geophysics is the science of physics as it applies to geology, and includes the measurement of seismic movements, geodesy, gravity, magnetism, electricity, electromagnetism, and radioactivity. In a similar way, geochemistry is the science of chemistry as it applies to geology. It looks at absolute and relative abundances of the chemical elements and their isotopes in the Earth, and also the chemical changes that accompany geologic processes. Planetary geology, as its name suggests, involves the study of planets and moons other than the Earth itself, for instance, Mars, Venus, and the moons of Saturn and Jupiter. Planetary geologists place great emphasis on the results of space probes to provide information. Marine geology looks in particular at ocean floors and coastlines, and uses geophysics, geochemistry, sedimentology and paleontology to aid its research. Its studies also have links with oceanography and plate tectonics. In the old days, glass was just sand heated till molten and allowed to cool slowly, remaking itself into a clear, cohesive unit. Modern builders add soda ash to lower the temperatures needed, followed up by limestone to increase the substance’s stability. Limestone - made of millions of bones piled up on ocean floors over eons - is easy enough to come by. The ash is harder. It can be mined - though deposits are rare, occurring in patches along rivers and underneath lakes too small to be reliable - or harvested from seaweed, but not easily. And so in the 1800s chemists sallied forth determined to secure a cheap and reliable source of soda ash, armed with equipment and information generations before them could only dream of. Early solutions were effective but not efficient, requiring expensive inputs and producing a number of toxins alongside the treasured ash. But the eventual solution was a scientific gem - cheap, easy, and clean, it required only carbon dioxide from a fire, some inexpensive ammonia, and water, as salty as you could find it. By 1864 the new process had begun to catch on, as the news of the breakthrough started to spread around the globe, another stunning victory of the industrial revolution. The process had actually been discovered over fifty years earlier, by a physicist who would die of tuberculosis without publishing what he found. And so no one objected when Ernest Solvay, the Belgian chemist, described the process as an invention of his own; no one spoke up when he decided to name it after himself. Across the ocean, in a small town in upstate New York, a farmer turns his fields over on a rusting-out tractor. The big crop in this area is horse corn - low quality stuff that’s typically reserved for feed mixes, though upstate locals will eat it without any complaints. This farm has historically gotten decent yields, though it shrinks every year as the mudboils expand. These mudboils are unique in the world, as far as we can guess. Water, bubbling up from deep aquifers, liquifies the soil to the point it becomes a non-Newtonian fluid, like mixing cornstarch and water. Move slowly and you can walk from one side of the boil to the other; move too quickly and you’ll be sucked into the pit. These mudboils grow slowly, a few square feet each year, and have the capacity to move soil out into Onondaga Creek, killing fish and lowering water quality before being swept out to nearby Onondaga Lake. 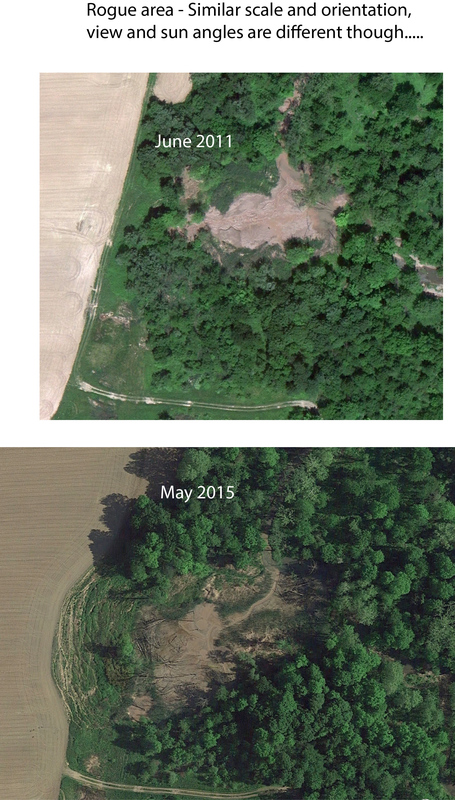 These mudboils have been stealing land from this farmer for decades now, in addition to causing two nearby bridges to collapse and a gas pipeline running across the property to rupture. In Tully, New York, it feels as though the Earth has begun to fight back. Seawater is about 3.5% salt, enough to make humans violently sick from drinking too much of it. Come the 1880s, the market for soda ash was strong enough that two young salesmen licensed the process from Solvay, with the goal in mind of bringing it stateside. The salesmen had spent several years pouring over maps, looking for anywhere that could provide enough salt to power the process. Syracuse seemed an obvious choice. Known as the Salt City, it had long served as a known hub for western expansion, with its deeply buried salt beds used to cure meats and treat wounds on the journey to the Frontier. Generations past dug expansive mines through the deposits, a venture fraught with the risk of tunnel collapses and toxic gas buildups. To reduce the risk, businessmen experimented with a number of techniques, settling eventually on digging saltwells where clean water would be pumped down onto the saltbeds, mixing and becoming a salty brine which would return to the surface to be boiled down. Solvay’s process didn’t even require the boiling. As such, the two businessmen purchased a small plot of land just outside of Syracuse, choosing a small Irish enclave to host their enterprise, named the Solvay Process Company. As business took off and the original salt supply was exhausted, the businessmen purchased another tract of land in a town about twenty miles south, building pipes to transport the material mined back to the processing plant. The small town the businessmen settled in was renamed “Solvay”, to celebrate the promising new industry. The mining town was named Tully, of course. Oklahoma is not a state naturally predisposed to earthquakes. Inland enough to avoid the worst of tectonic tremors, the state historically has had fewer than three major earthquakes a year. Until 2009, when there were twenty - the most since records began in 1889. That record would last until 2010, when there were forty-three. 2015 had nine hundred and three. Geology works slowly, if you notice it at all. Soil processes take decades, if not hundreds of years, to cycle completely; rocks form over millennia. But humans don’t have the right perspective for geologic time, to say nothing of the patience, and are prone to acting without fully understanding the effect they have on the world around them. In Oklahoma, this story is about fracking. Gas companies inject water deep underground in order to fracture rocks, allowing gas to flow faster into their collection wells. The companies can collect more gas than usual, cheaper than usual, from deeper than usual, and pass the benefits to the client. But as years go by and more rocks are fractured, and more and more water is pumped underground. And when the bedrock is no longer solid and there’s a layer of water between the pieces, things have a tendency to… shift. We can’t predict where these earthquakes will occur; we simply don’t know enough about them. And even with the closing of many injection wells and the throttling of others, there were still 294 major quakes in Oklahoma this past year. On the bright side, the state’s insurance industry has been booming in recent years. About 500,000 people have picked up earthquake policies since the epidemic began. In Tully, the story is a bit more complicated. The caverns left underground by salt mining resulted in sinkholes, filling in what used to be an even layer of salt with compressed dirt from above. This interrupted the flow of water underground, in the process damming up an underground river and leaving the water with nowhere to go - except for up. As the water raced towards the surface, it picked up some small pieces of soil, carrying them above ground. More sinkholes formed to fill the spaces those pieces left in their place, forcing more water to move towards the surface, and the cycle repeated. This process has been happening ever since two businessmen first began to mine in Tully, but it’s been worsening in recent years. The farmer’s fields are collapsing under their own weight, falling back towards Onondaga Creek, towards being swept into the lake. The mudboils keep growing. And - although the United States government denies a link - the tribes native to the area blame Solvay for a recent landslide in the area, the likes of which hadn’t happened in the area for over six thousand years. For what it’s worth, the original Solvay Process Company plant was closed in 1985, being demolished shortly afterwards. The company took with it a $42 million dollar payroll as it left, leaving the town it renamed in its own image just another hollowed-out town in Upstate New York. The company itself had been acquired all the way back in 1920, by a company which would eventually be held liable for pouring 165,000 pound of mercury directly into Onondaga Lake following World War Two. Its headquarters are now in New Jersey, a harsh, modernist building like those found in any office park. It’s nothing special to look at - white tiled sides, some small signage - but I found myself transfixed by the building nonetheless. I couldn’t help but stare at the building’s many picture windows - each and every one a minimalist frame filled with perfect, clear, mass-produced, ash-filled glass. The science which treats: (a) Of the structure and mineral constitution of the globe; structural geology. (b) Of its history as regards rocks, minerals, rivers, valleys, mountains, climates, life, etc. ; historical geology. (c) Of the causes and methods by which its structure, features, changes, and conditions have been produced; dynamical geology. See Chart of The Geological Series. A treatise on the science.